Welcome to the PsychicWorld local psychic guide for the Southern United States. Here you will find a list of all southern States and local directories of psychics for all major cities and metropolitan areas in the south and deep south. The south is known for it's devoted christians as well of course for New Orleans (Louisiana) Voodoo. At psychicworld we pride ourselves of having one, if not the best, Voodoo expert active online. The divine Prince Ty Emmecca is a world renowned psychic reader and voodoo practitioners. For more ressources and information about Voodoo you read these blog posts or simply book a session with your local, Louisiana Voodoo expert: Ty Prince! 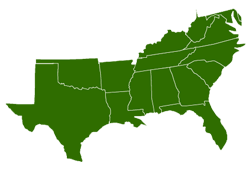 These states fall under what we refer to as the Southern United States*. In order to find a curated list of psychics near you, just click on your home state and see if there is a psychic in your vicinty**. ** Is your town missing? If you want us to add it to our local psychic directory please send us an email through the contact form.